Fried potatoes have a crispy, and often salty, exterior that encases a fluffy and meaty interior. Though fried potatoes are most commonly made of strips or cubes, you can fry them whole as well. Serve a whole fried potato as you would a baked potato or a helping of tater tots. Approximately half an hour is required to fry a whole potato. If you are frying multiple potatoes, work in small batches of four to six to ensure they cook evenly. Rinse the potato under warm running water for 60 seconds. As you rinse, rub your hands over the potato's skin to remove dirt. Use a vegetable peeler to remove the potato's skin. When working with a vegetable peeler, always face the blade away from your fingers and body to ensure you do not cut yourself. Place a large pot over high heat and fill it halfway with water. Add the salt and allow the water to come to a boil. Place the potato into the boiling water and cook it for 10 to 25 minutes, depending on its size. Check the potato's doneness every five minutes by poking it with a fork. When the fork slides in easily, the potato is cooked. Remove the potato from the boiling water and pat it with a paper towel. Set it aside to dry. Place a deep skillet over medium-high heat on a stovetop and add 2 inches of refined peanut oil. Allow the oil to preheat for five minutes. Carefully place the potato into the hot oil and allow it to fry for four minutes. As it fries, use the fork to turn it so all sides crisp evenly. Remove the potato from the hot oil and pat it dry with a paper towel. Serve the fried whole potato while it is hot. Refrigerate leftover fried potato and consume it within 48 hours. Do not skip the step of poking the boiling potato with a fork. 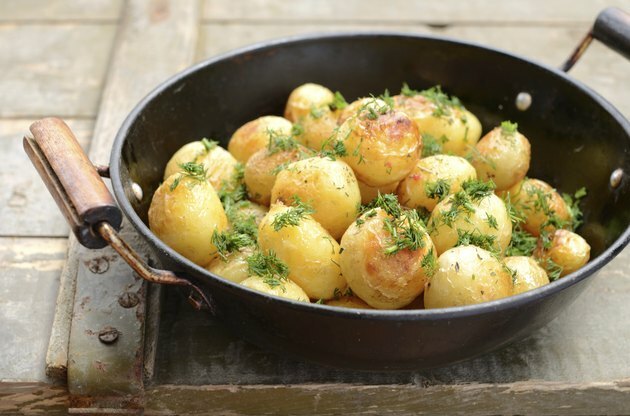 Aside from checking doneness, the poked holes ensure the potato does not explode in the hot oil.